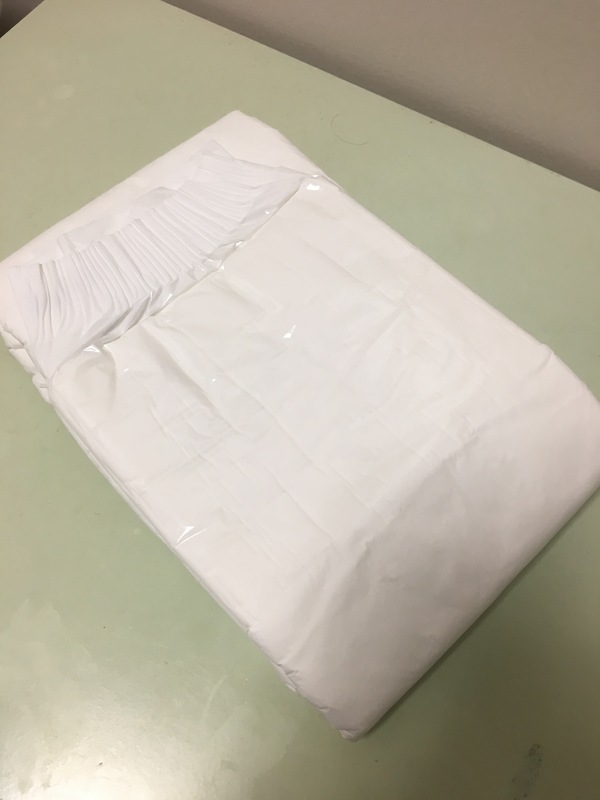 So, as a frequent bedwetter, I order diapers in bulk pretty often. With a recent order from NorthShore Medical, I received a sample pack of their new line, the NorthShore MegaMax. They boast it as a less bulky, yet slightly larger in size and holding capacity than their other styles. I personally have an issue with standard adult diaper sizes, as I have large hips, so I was eager to see if their slightly larger sizes would make a difference. Anyways, lets get right into it, shall we? 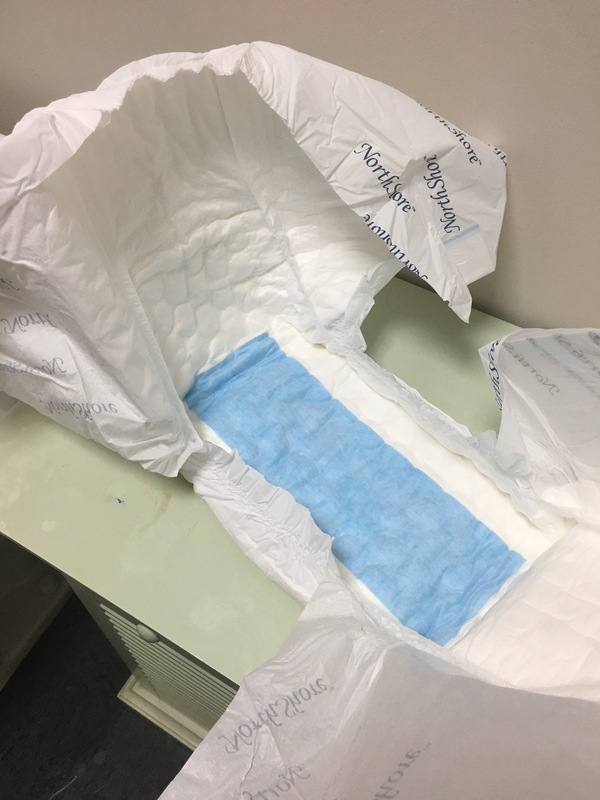 To start off, The diaper itself is noticeably thinner than their Supreme or the ConfiDry 24/7 (another brand that NorthShore offers), and has one other large difference that ABDL diaper brand followers will notice right away... A landing zone for the tapes. Opening it up, there was one thing I really didn't care for.... they branded NorthShore all over the wings of the diaper, which just looks.... tacky. So, after this came the test to see if the "increased length and width" would match up to my hips. This is the major reason I stopped getting the NorthShore Supremes and went to ConfiDry 24/7's, because they're just a tad bit bigger sized, and fit me much better. Well, the MegaMax also fits me a bit better, and has about the same sizing as the ConfiDry's, so whether or not that suits you, it is definitely something to take into consideration. You'll notice as well that the NorthShore logo is clearly visible on the sides... not too thrilled there. As it swells, the landing zone starts to peel from the plastic not really wanting to expand as much as it does. This doesn't affect the tapes, which held strong, and I was able to tape and re-tape them several times (though I didn't feel any need to, honestly). These pictures were taken about 4 hours and 8 hours in, and I would say that it was at half capacity at the 8 hour mark. Another thing that surprised me was the noise level of this diaper. At the start, the thing is near silent, making it great for discreet wearing, but the more wet it got, the louder every party of it became. The landing zone crinkles more under the stress of the stretching plastic, the plastic rubs more against itself as it swells, and that is something I've not ever really had happen with an adult diaper. I've had the opposite, where they get quieter as they get more full, but never louder. So, all in all, I feel I can sum up a review of this diaper with one simple thing. Its NorthShore's attempt to make an ABDL diaper. It swells more and makes more noise as you wet it, which is something ABDL's usually look for, but not people with incontinence issues. However, this aside, it does hold up well, and if you've got a little bit larger hips (like me) or find that most Medium sizes don't fit you so great, then absolutely look into giving these a try. They are not at all like NorthShore's other styles, though, so don't go into it looking for a slightly different Supreme. Let me know what you guys think, and I'll try to answer any other questions you have as best as I can below! Those are some fat tabs! I like them! thanks for sharing! Comparing them side by side with Dry24/7s, they are not anywhere near the same size. A medium 24/7 fits me very comfortably, but I could not fit in a medium Megamax... and the larges were too big.